In the article Finding a System Using the HO/AO Quotient I showed you how to identify profitable clusters where the market constantly over- or underprices the bets on offer and, based on this knowledge, the article Judging the Risk of a Football Betting Portfolio addresses how to piece together a portfolio and judge its risk prior to execution. Managing and following through with the plan is illustrated in the 2017-18 Winter League Report – 35k in 138 Days, where the full performance of our selections is analysed and dissected. But remember, the best compiled portfolio won’t work without proper bank management and staking. Week 38 was the busiest with 24 bets in total, whilst week 50 saw 23 bets. Within a relatively small portfolio of just over 500 bets, the average number of bets per round was 11, but the observed spread was anything between 0 and 24 (2 rounds without bets). Even with a small portfolio, bank management poses challenges, especially when juggling numerous bookmaker/exchange accounts. Monitoring the balance of each account can become difficult, which may lead to liquidity issues (perhaps not enough in the account) and the constant hassle of moving money between your accounts (or playing with smaller stakes than intended). Trying to get the highest odds possible in the market all the time becomes unrealistic as the total betting bank would need to be spread over many, many bookmakers. As harsh as it may sound, you will have to accept that aiming to achieve the highest odds available in the entire market at any moment in time is virtually impossible, and the choice of bookmakers/exchanges has to be limited from the start. I recommend limiting your bookmaker/exchange accounts to a maximum of five or six, and simply choosing best price between them at the time you wish to place a bet. It makes little difference to the results when limiting your accounts to just a handful and you will see evidence of this in our 2017-18 Winter League Report – 35k in 138 Days. 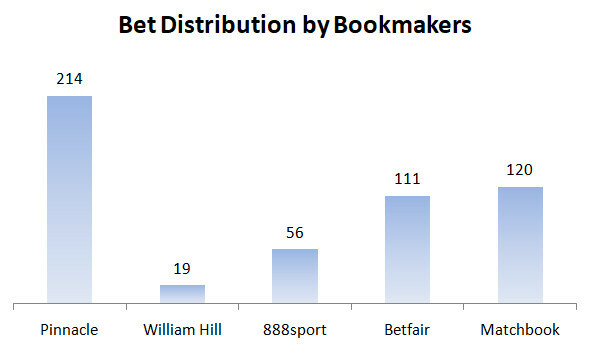 The screenshot below shows the bet placement distribution by bookmaker/exchange. Lesson 1: Limit your choice of bookmakers/exchanges! To determine the stake size there are a few things to consider. Firstly of course, the size of your starting bank. This is an easy one to call – You know what funds you have. Go to the ‘data’ tab in the HDAFU Tables, copy and paste all applicable matches and amalgamate them in one spreadsheet. Sort the data into chronological order and group it by weeks/rounds. Count the number of bets with each bookmaker/exchange in each round. In our example, you can clearly see that Pinnacle had the majority of bets (up to 15 in one round), Betfair and Matchbook were the next most used (up to seven bets per round), followed by 888sport (up to five bets per round), and lastly, William Hill (up to four bets). But, if you have no past experience it may be harder to estimate which of your chosen bookmakers/exchanges are most likely to have the highest odds when you are ready to place the bets, and how future bets may be distributed between your accounts. If you have no past figures to guide you, then it is probably best to distribute your betting bank equally between your chosen bookmakers/exchanges. In this case (five accounts), an even split of the starting bank of 4,000 units means 800 units in each account. Lesson 2: If you cannot calculate the most probable distribution of your bets between the bookmakers of your choice, then simply distribute funds in equal amounts between your accounts! The major question is how each betting round is going to perform. Is the portfolio going to make a profit or a loss? Which account will accrue the biggest proportion of profits? Which will be the most high-maintenance, requiring the most re-deposits? In total, there were 47 rounds (weeks) of betting. 17 of these (36.2%) finished with losses. (Effectively one losing round in every three). There were four months (15 rounds) between week 50 (9/12/2017) and week 11 (11/3/2018) where the portfolio experienced a seemingly never-ending rollercoaster ride. During this time, eight rounds (over 50%!) 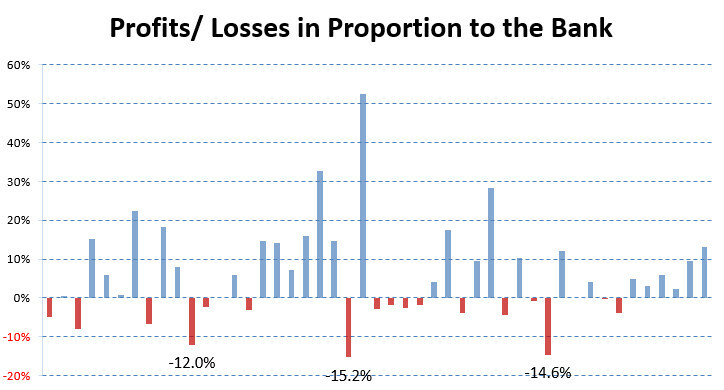 produced losses as seen in the image above. Those three months were especially difficult on the nerves. However, this still doesn’t tell us the best stake size. 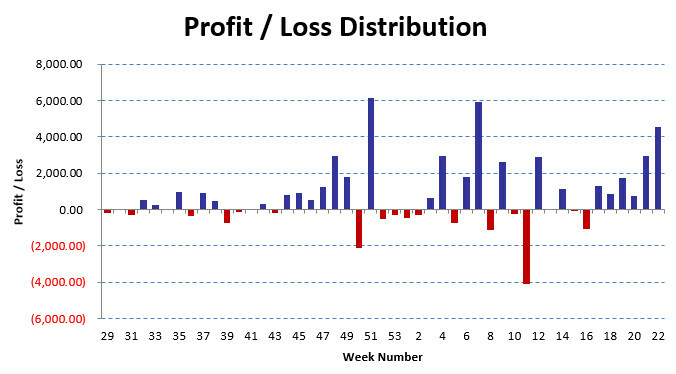 There is also no sense looking at which bookmakers incurred losses, as the past distribution will very likely not repeat itself during the forthcoming new season. As you can see, there were three occasions where the bank dropped by more than 12% of its total. 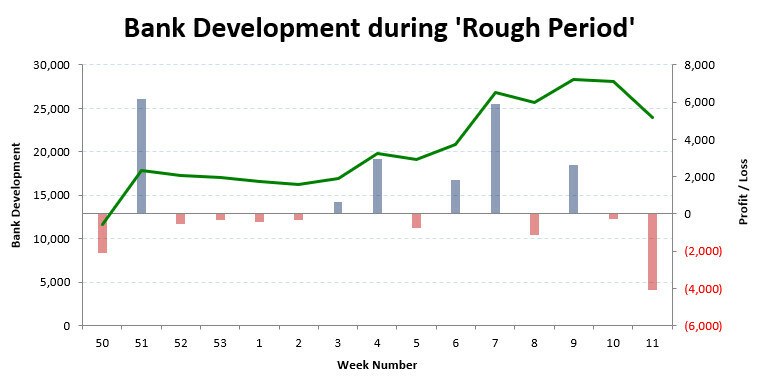 In the worst single round (week) the size of the bank contracted by over 15%. 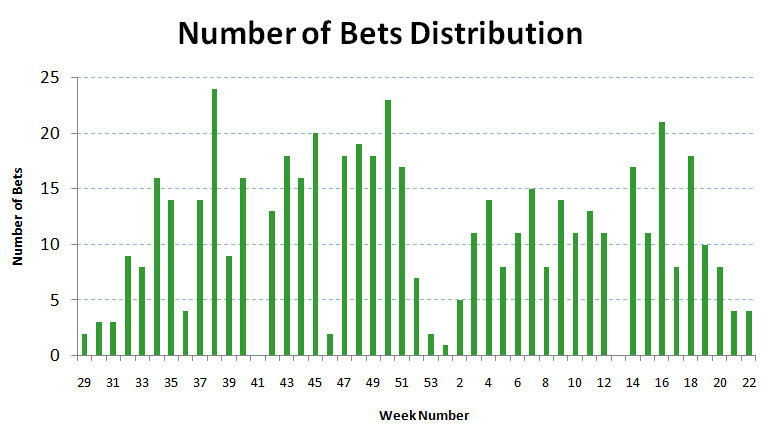 Furthermore, we know from Image 1 (distribution of bets per week) that if we are going to employ a similar portfolio of bets in future, that there will be up to 25 bets in a week (round). We have no idea which of the 25 bets will win and which won’t, and the intention of the staking plan not to be bankrupt after any one week of ‘bad luck’. Also, we don’t want to be in a position after experiencing a ‘bad week’ where we are forced to reduce the size of our stakes. Better to arrange the plan so that we can ride through any longer periods of ‘bad luck’. We have distributed our funds between accounts but we don’t know which of the chosen bookies/exchanges are going to receive the bets. The average of 12%, 15.2% and 14.6% = 13.9% (rounded: 14%). Although very unlikely, there may be a run of losses (say three rounds in a row) where the bank is depleted by 14% each time, and should this happen, we still need to continue placing bets without having to reduce the stakes. As mentioned, we are expecting a maximum of 25 bets in a single round. So, if we risk 2.5% of our betting bank per bet, we will still be able to survive three hefty losing runs without having to reduce the stakes. Lesson 3: Limit your stake to 2.5% if you have a portfolio of around 500 bets coming up for one season. If you have a larger portfolio, use your past experience or figures to calculate your maximum stake size as shown above! Can a Portfolio make Profits during a Rough Patch? Prior to week 50 the bank size stood at 13,792 units, but after enduring a really volatile period (where more than one round lost in every two) the bank had risen to 23,960 units. This was only possible by using a strict staking plan in combination with stake ratcheting. Apply and stick strictly to the set rules, and NEVER experiment and/or change your staking midway through a campaign! Once decided. Stick to it! You may find it helpful to follow the explanations in this article with the help of our Excel monitoring workbook. Not only does it contain the match data and calculates the bet distribution, but includes many more Excel formulas and ideas to help you grasp how to record and control your own betting ventures. We are sure that you will feel the nominal £5.00 GBP charge is a real bargain. I hope you enjoyed this article and learned something about the unavoidable randomness of the distribution of bets within a portfolio and how to keep your bank under control despite the inevitable peaks and troughs. However, if you are still unsure on any point, please feel free to ask any questions via the comment section below. Thanks for your valuable insight and contribution. Regarding your staking plan. How did you decide to ratchet it at the time you did? Only, you reached a new summit and then losses occurred that lowered your profit but went with the lower amount instead of the higher achieved weeks before in some cases? I am curious as to why you did this on some occasions. I’m a “lazy” person… I only take time to review and to recalculate things once a week. Therefore, the ratcheting is done weekly. Every Monday. Have you read this article here? Sound Staking: Flat Stakes & Ratcheting This will explain more. For example, since last week Friday, I worked for example every day 12 hours to migrate Soccerwidow to HTTPS (not alone though, we are two people, I and a programmer), and we are still working on that. The site was even down a few times and we had to get it up again as quick as possible. It’s a truly challenging process. What I’m trying to say… Betting isn’t my full time occupation. Running this Soccerwidow website, is.